President Obama and his family presided over the 88th lighting of the National Christmas Tree on the Ellipse in Washington during a chilly late-afternoon ceremony on Thursday. 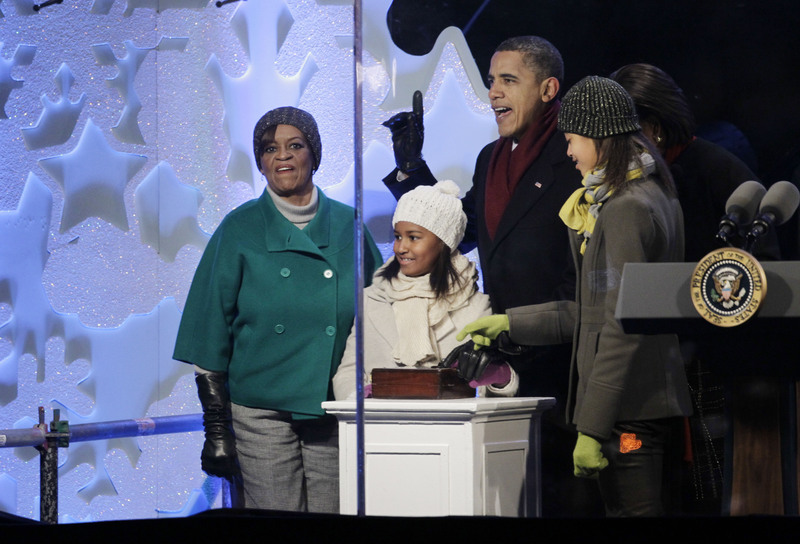 Mr. Obama was joined by his wife, daughters Sasha and Malia, and his mother-in-law Marian Robinson in flipping a switch to light the tree midway through the ceremony. In brief remarks, the president noted his religion in discussing the story of Christmas, telling the crowd, "It's a story that's dear to Michelle and me as Christians but it's a message that's universal." The first National Christmas Tree Lighting ceremony took place back in 1923, with President Calvin Coolidge presiding. Among those who entertained attendees at this year's event were Maroon 5, 10-year-old singer Jackie Evancho and Jim James of the band My Morning Jacket. 3,000 people attended the festivities, having won tickets through an online lottery.